When playing pool in the kitchen is just that! The other day, I was copied on an email at work. It was from the IT lead in my organisation. Last week, Katrina Kolt (that’s me! ), took me on a tour of the facilities at the accounting software company MYOB. I was astonished to see at 10am on a Friday, two young guys in the kitchen, playing pool! No doubt, what they were actually doing, was collaborating on a difficult IT problem! I’m so glad you enjoyed the tour at MYOB. I did too. It is correct that it was Friday, and it was 10 o’clock, and there were indeed two guys in the kitchen, playing pool. I’m not sure though that they were collaborating on a difficult IT problem. I’m guessing that they were just playing pool. What is true though, is that two team members who work hard, and then take time out to play pool together, will no doubt be able to collaborate on solving a difficult IT problem. Agile values individuals and interactions and Agile processes promote sustainable development. When you saw two guys taking time out to play pool in the kitchen you saw both these principles in action. When this guy, albeit in astonishment, referenced an Agile practice in that email, what he was really doing was acknowledging his learning, as a result of a field trip! While it’s nice to turn up, look around a groovy office space, say thanks and depart, if you do that, then you won’t be making the most of a great opportunity. First up – don’t take someone on a field trip, unless you have a clear vision of what outcome you want to achieve. Make sure you provide background info to tour participants to help achieve your goal. In the case of this guy, who had no Agile knowledge ahead of meeting me, I put together an Agile primer. I engaged him in conversation about Agile ahead of the tour. Your preparation also needs to include talking with the people who are hosting you, ahead of the day. Explain the purpose of the trip to them. Discuss a suggested agenda. Tell them heaps about who is going to be attending, what their understanding of Agile is, or is not, what level of detail to provide to the guests. Explicitly check if it is Ok to stop the tour guide to ask questions, or to point something out to the people on the tour. Check if it is Ok to take photos. On the day. Make sure you introduce the people who have come along. Don’t just say. Hi guys, this is my team from [insert organisation]. Make sure you make the tour guide aware of who’s who. This is John, he’s the IT lead for my company. Use this as an opportunity to remind the people attending why they are here. John’s curious to see how you’ve set things up to support Agile because we are going through this process right now. This is Paul, he’s our architect, and he’s designed a terrific office space for Envato. It supports Agile practices, but he’s keen to see how you’ve done it here in a much more scaled Agile environment. When you see people “pairing”, then point out this behaviour to the tour participants. Don’t interrupt a stand-up, but listen in as chickens at a couple of different stand ups. A good host will arrange for you to be able to chat with the Scrum Masters after the stand-ups, so that you can be walked through how different teams do stuff. Use the different information radiators on the wall to initiate conversation. That’s what they are there for! Make sure you thank your hosts and ply them with heaps of extremely unhealthy treats (in the proper Agile fashion) so that they can share these between the teams you visited. Immediately after an awesome tour, you’re going to need and want to chat about what you saw. Allow time for a coffee or lunch to have an informal conversation and compare notes. But don’t just let the experience of the tour end there. Make sure that you schedule some time to take staff offline for a couple of hours, so that you can do something with the learnings from the field trip. 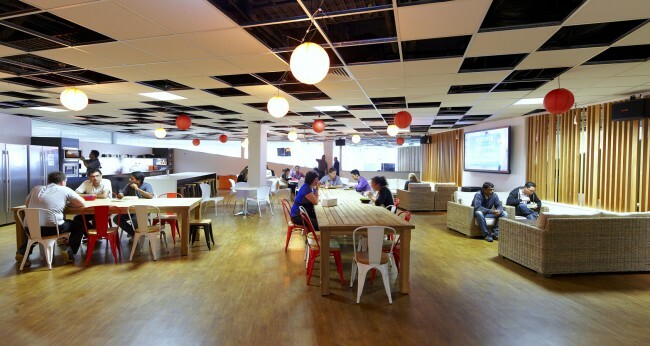 After our trip to MYOB I collaborated with the IT lead, to design our new office space. What Agile principles do we utilise in our workplace? What Agile principles did we see in action at MYOB? How can we adopt some of these to improve the way we do things? You can create large visual charts with this info to display around the place, so that other teams can learn too. He now knows my name! I got to be involved in designing our new work space! I now have an Agile champion in the organisation. This entry was posted in Agile, Scrum and tagged Agile, Field trip, Scrum, Scrum Master on June 19, 2014 by Katrina Kolt.